Discover how we've turned the powerfully engaging quiz into a potent way to grow your business. This happened because, on the surface, the show was entertaining and engaging, but underneath the surface there was a strategy in place to take advantage of the attention the show had created by actually teaching the kids something. This allowed Sesame Street to become one of the longest running children’s shows AND one of the largest, most affordable early childhood interventions ever. You can take advantage of this same concept in your online business. You see, on the surface, Thrive Quiz Builder is an amazing quiz builder. It will help you easily create beautiful and complex quizzes to engage and grab the attention of your visitors without needing to know how to code or work photoshop. However, the real power of Thrive Quiz Builder happens underneath the surface of the engaging quiz. Because what you really want is to be able to take advantage of the all extra attention the quiz can generate. 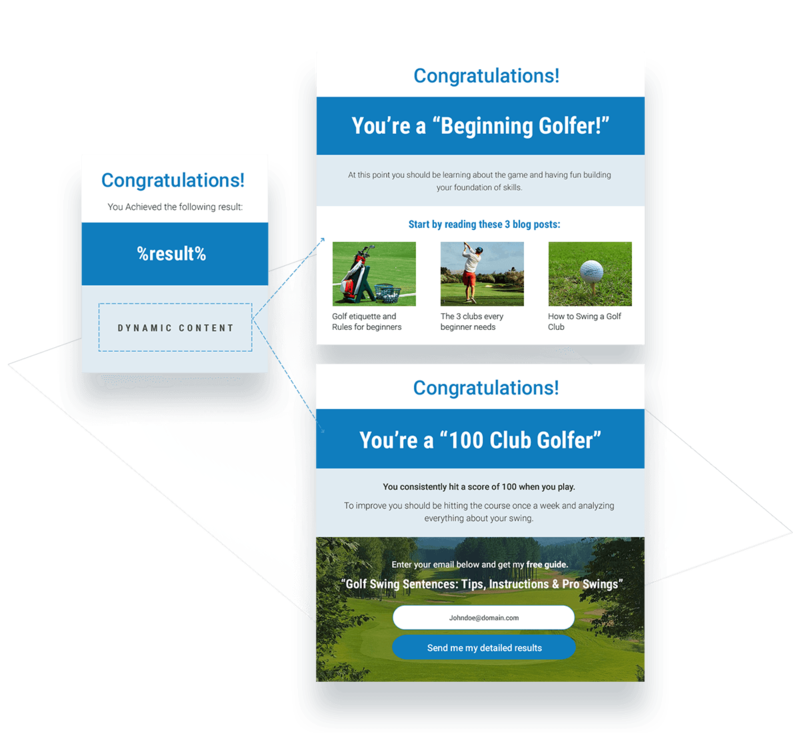 Thrive Quiz Builder's under the surface system will help you increase your email list, social shares, AND give you data to grow your business. We’ll dive “under the surface” a bit further down the page...Let's start above water first. What would it mean for your online business if you could create irresistible quizzes your customers couldn’t wait to consume? With engaging content, on the other hand, you’d be feeling pretty slick every time you checked your analytics and saw the increase of traffic to your website from Facebook. And that bounce rate! How nice would it feel to watch it decrease and realize people are clicking through your content, gobbling it all up and engaging? Thrive Quiz Builder not only gives you the ability to create extremely complex quizzes with branching logic, it also makes it extremely easy to visualize what your quiz looks like and how it flows in our quiz builder window. Easily see all the questions, answers and their flow so your quiz works like you want it to. Build branching quizzes where you ask different questions based on the previous answer. Choose between text or image questions. 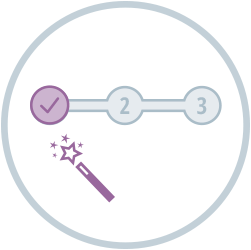 The setup wizard will walk you through each step so you don’t forget anything. The troubleshooter will alert you if something is missing or stops working so you can quickly fix the problem. No need to learn how to code, the question editor is like having your own personal developer. No need to learn how to use Photoshop, the social badge editor is like having your own personal designer. To get people excited about sharing, you need to give them something share-worthy. Something that looks professional and cool. 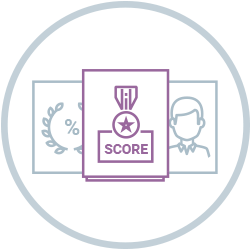 The built in badge creator in Thrive Quiz Builder does just that. Create badges people will actually want to share. Forget margins, padding and CSS - move elements anywhere without restriction. Upload images, resize them, add text with any formatting, set background color and opacity to get the exact look you want. Built in social media sizing. Choose Facebook and the badge will be optimized for Facebook. You never have to open Photoshop to resize. I’m so excited. I just purchased another quiz plug in yesterday. Needless to say, I need to get my refund. What you are doing here, is beyond amazing. Thank you! Well, I can no longer ignore quizzes and now it is going to be fun. Out of the park! What happens when you go into a store to buy something and you run into an employee? Then they take you there, asking and answering questions and helping you decide what you need. It’s a simple, yet effective way to gather insights, make a specific recommendation and then a sale. 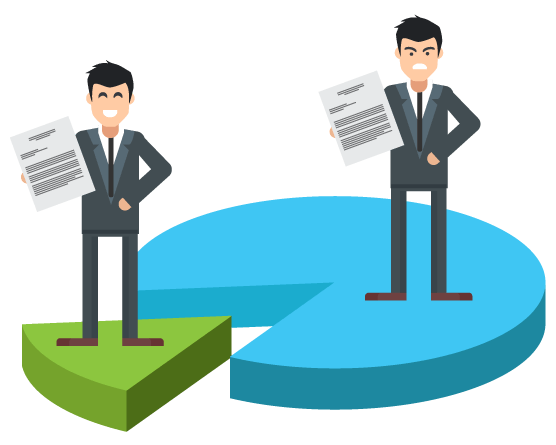 Creating a valuable opt-in offer to build your list and then asking your subscribers down the line to fill out a survey or hop on a customer development call with you? Hunting down forums and other blogs in your niche and reading through hundreds of comments to gather insights on what your visitors might want? Installing Google analytics, checking a few reports and then trying to make sense of the numbers/graphs and how to actually use the information to grow your business? Creating multiple opt-in offers, segmenting the subscribers based on their opt-in and then sending them relevant content through email? 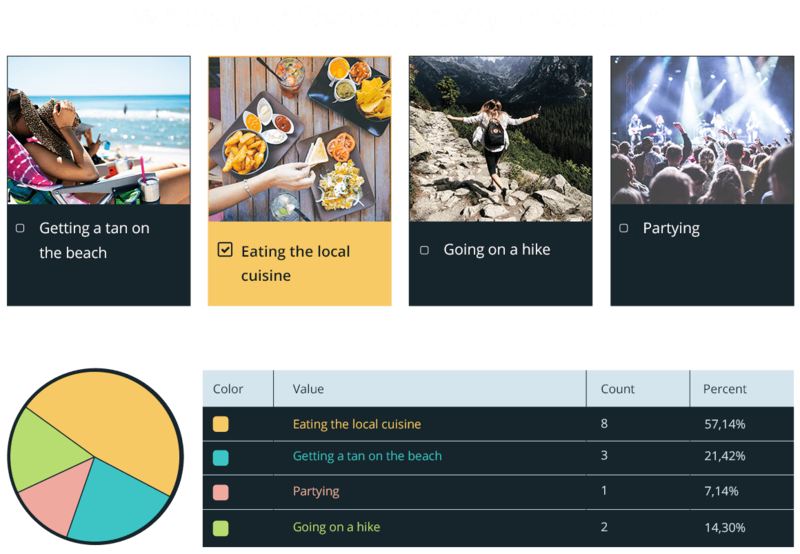 Thrive Quiz Builder eliminates the hassle of gathering insights and turns it into a seamless process by using a quiz to help your visitor decide what they need in a simple and engaging way. Then based on the answers they give, you’ll be able to make a specific and expert recommendation...just like the simple, yet effective store employee. As people go through your quiz, Thrive Quiz Builder is collecting all of the data and compiling it in detailed reports so you can see how people are interacting with your quizzes, which answers are given and by how many people. It's a more engaging, more fun version of a survey. Imagine how much easier it is to come up with good ideas for new blog posts or new products to offer your audience when you have these kind of insights available. Imagine you have a travel website, one of your quiz questions could uncover what type of activities your readers enjoy, which would allow you to write more relevant blog posts. In the question below you see that 57% of people enjoy eating local food compared to 7% who enjoy partying. 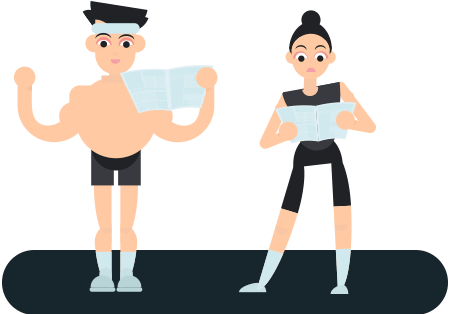 Because of the insights generated by Thrive Quiz Builder, you know it's a better idea to write blog posts about finding the best local food instead of the best clubs to party at. With Thrive Quiz Builder's dynamic content you can take action on your visitor's answers on the spot by showing them different content on the results page based on what answers they gave during the quiz. The dynamic content can be anything from a personalized recommendation about what to read next on your site, to product recommendations or affiliate links that are highly targeted and relevant to this individual visitor’s interests. Below you can see how dynamic content might work for a quiz about golfing. If the quiz taker ​is a beginner their results page shows them 3 beginner level blog posts to read. However, if they're a more advanced golfer the results page will show an opt-in form for a higher level guide on golf swings. There’s nothing more frustrating than painstakingly building a mailing list, crafting the perfect email, hitting send and then seeing low open rates, low click through rates and feeling like your audience doesn’t care about what you’re sending them. This is a very common problem and it happens when you throw all of your subscribers into the same bucket. Imagine you have an audience of people interested in fitness. Does it make sense to send out an email to all of them about how to build muscle? Sure, some of them will find it helpful, but some of the audience might have a goal to lose weight and get slimmer. For the people who want to slim up and lose weight an email about building muscle is a waste of time. If your list isn’t segmented, then your emails will always make some of your audience happy and be uninteresting to the rest. The solution is to not treat everyone the same. 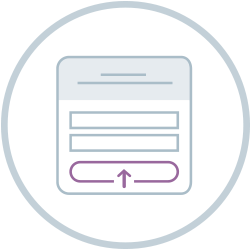 With Thrive Quiz Builder, you can have people sign up to different mailing lists or different segments of your list, depending on the result they get at the end of a quiz. This allows you to send highly targeted messages that are relevant to your readers. You can send emails about building muscle ONLY to the audience interested in building muscle and you can do this by having them take a quiz about their interests. Imagine how much easier it is to monetize a mailing list when you have exact segments based on your subscriber’s interests. This really is super exciting Thrive Team!! 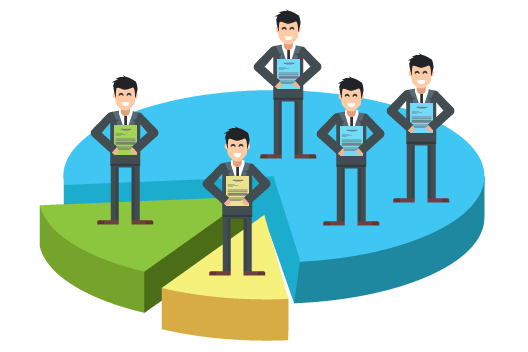 Like Shane talked about, segmenting targeted prospects is crucial and this is the best way to do it. Thanks again. My Thrive annual membership is up for renewal in February and you darned sure better bet I’m going to renew. Yeah, we’re still not done. 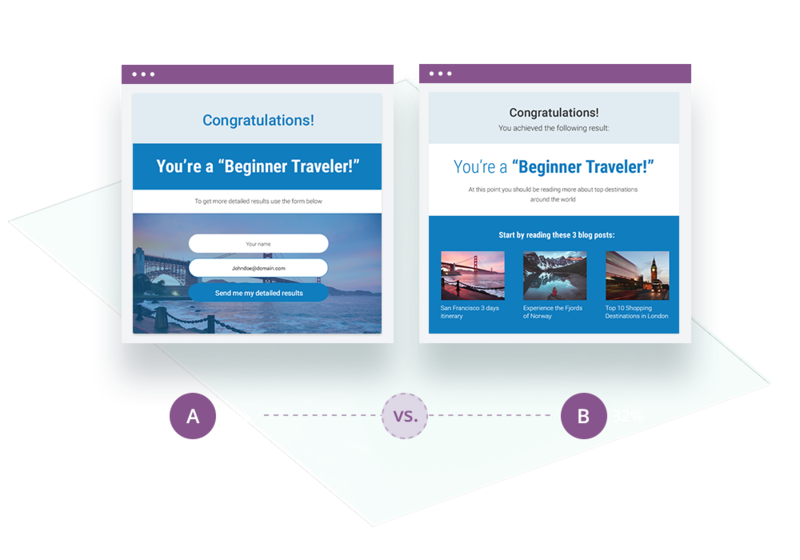 Thrive Quiz Builder is built to create conversion optimized quizzes. That’s why, in this plugin, you can A/B test and optimize each of the critical stages in a quiz. You can A/B test the splash page, to find the best layout to get more people to start the quiz. 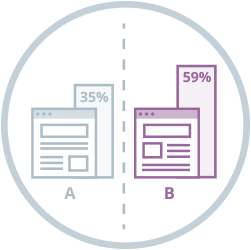 You can A/B test the opt-in gate or opt-in forms on your results page to get higher optin-conversion rates and grow your list faster. You can even A/B test the result page content and layout to get more social shares. 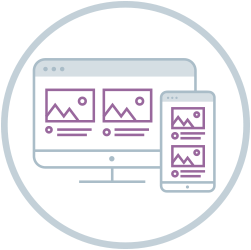 Our interface makes it easy to create one or more test variations and launch an A/B test quickly. 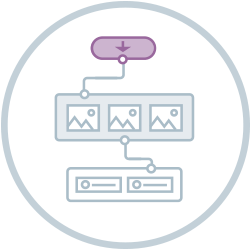 Plus, you can even put the test on autopilot and let the plugin automatically eliminate underperforming variations until only the highest converting designs remain. Number - Display the final result of the quiz as a number. The visitor will be given a number score based on how they responded to the questions in the quiz. e.g. A “Where in the world is this?” quiz would tell you "You got 10 right!" Percentage - Display the final result of the quiz as a percentage. The visitor will be given a percentage score based on how they responded to the questions in the quiz. e.g. A quiz titled "Only 1 In 50 Dirty Dancing Fans Can Ace This Test" would tell you "You got an 80%!" Track Across Time - See results across any interval (daily, weekly, monthly, total). Starting Vs. Finishing - See stats on how many people are starting and finishing the quiz. Quiz Flow - See where visitors are dropping off, which conversion goals are successful, and the most common path being taken. Individual Question Stats - See how each question is being answered. Social Sharing Stats - See what results are getting the most shares. User Stats - See a log of each quiz takers flow and how they answered each question. Build From Scratch - Build a quiz from scratch with no predefined settings. List Building - Quiz optimized for building an email list. The results page is visible only if the user signs up to the list. Social Shares - Quiz optimized for social sharing. The results page contains a social share badge your visitors can share with their friends to increase the popularity of the quiz. All templates come with customizable pre-built splash and results pages so you can ship ASAP or change around to suit your needs. 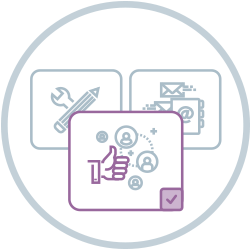 Create beautiful, fully customizable and engaging social sharing badges. Move elements anywhere you want without restriction. Resize images and add text with any formatting. Set different background colors and opacity levels. Chose pre-sized badges for the different social networks. 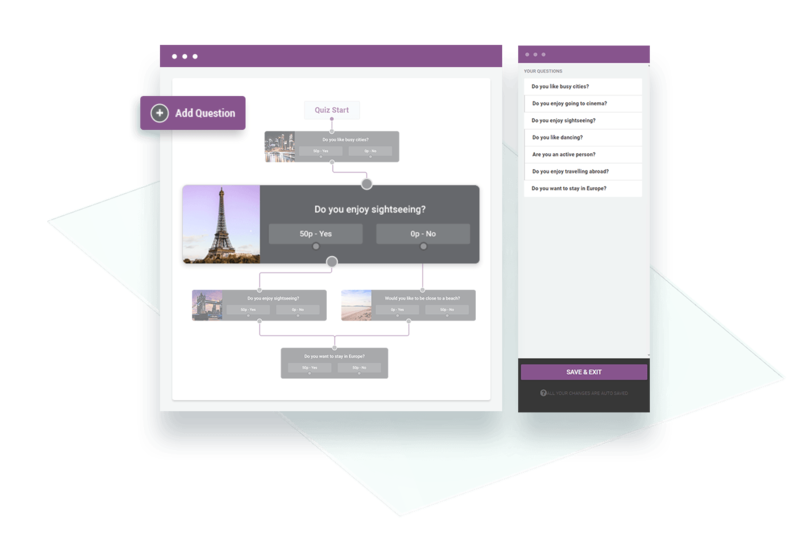 Overview Navigation - Easily navigate the most complex quizzes with a visual editor to see all the questions and answers that make up the quiz. Complex Logic - Ask different questions based on answers. All you have to do is drag and drop. Quiz Flow - See all the possible paths a visitor could take through the quiz. Make scoring more accurate based on the answer. Example: Imagine you have a "How social are you quiz" and one of the questions is: How often do you go out each week? You can give weights for each answer. 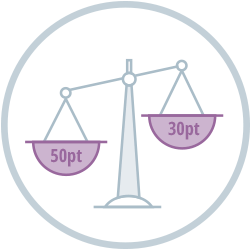 "Every night" would have a 10 point weight, "3-5 nights" would have a 5 point weight and "less than 1 night" would have a 1 point weight. This allows the "more social" person to get more points. Create a result page for every variation of your quiz. One set of content for one result and one set of content for a different result. Decide if the the quiz taker must submit their details before getting the result of the quiz. Decide whether the optin gate is to be forced or optional (it can be skipped). 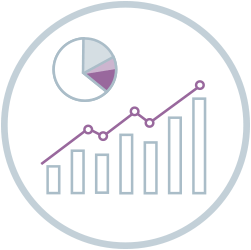 Result Page Testing - Find the results page that gives you the most conversions or shares. Splash Page Testing - Find out with splash page results in more people taking your quiz. And off course you can mix and match to make your quiz exactly like you want. Set up your quiz in the correct order and don't miss any piece. If something isn't configured properly or is missing an element, you'll be notified so you can quickly fix the problem. All quizzes look beautiful and work flawlessly on any device. Keep an overview on all the quizzes you create and easily see basic stats across all quizzes. 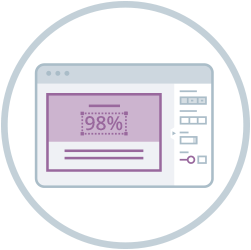 We're convinced you'll love Thrive Quiz Builder and that it will allow you to build beautiful and engaging quizzes, while also giving you access to powerful insights to truly understand your audience and help give them what they are looking for. However, if you're unhappy with the plugin for any reason, you can get a full refund within 30 days. No questions asked. 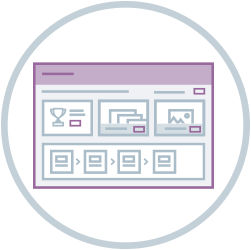 What's the difference between the "start from scratch" & the "ready made" templates? 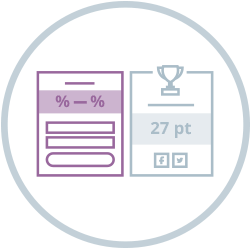 The main difference between the two is that the ready made templates come with a predefined quiz structure. For instance, a quiz that’s designed for social sharing will have a structure like (splash page > quiz > badge share) and a quiz that’s designed for building a list will have a structure like (splash page > quiz > opt-in gate), start from scratch templates allow you to customize the structure however you'd like. Yes, you can use images as answers for your questions. You also have the option to have text explaining the image if you want. Is there a maximum number of answers (text or images) that I can add to my quiz? Is there a maximum number of results categories a quiz can have? Yes. currently 12 is the maximum number of results categories for each quiz. Will I receive plugin updates for free? Yes. When we add more features you just have to update your plugin and you'll get them for free. You can upgrade to more licences at anytime and you will be changed the difference between the two. Is this a one time purchase? Yes, it is a one time purchase. However you can upgrade to more licences at any time and you can purchase extra support if the one year isn't enough. Can I see quiz data from a specific date range? Can my quiz be embedded in a Facebook Fan Page? No, you can only embed your quiz on your own WordPress website, but you can share the quiz on Facebook to get your fans back to and engage with your website. Yes. Throughout the plugin interface, you'll find tutorial videos that explain exactly what you're seeing and how to use it. 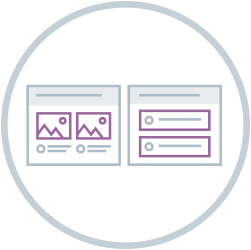 We also have an extensive knowledge base with tutorials and we have a reputation for providing some of the best training content in the industry, including training webinars for our customers. Can I export/download my quiz report data? Your purchase comes with one year of support. We'll do everything we can to make sure it works for you but if for any reason it's not what you expected, we offer a no questions asked, 30-day money back guarantee. If you aren't satisfied, just let us know within the 30 days for a full refund. I'm blown away by the potential effectiveness of this builder. I will surely use it to create and expand my list. Consider me as your new member. Thank you for creating these amazing products. In a world over run with poor value, useless junk and noise…You good people at Thrive Themes constantly deliver Value, excellent Tools, Training and Actionable Content! You guys are the best, I'm always singing Thrive Themes Praises. I purchased your Viral Quiz Builder a while back, but this here is blowing it out of the park. Thank you so much for your affordable innovation. What a great addition to the toolbox and such a fab intuitive set of features, right out of the gate. Well done Shane and team. We’ve been waiting for this for years!! (originally looked at Viral quiz builder as a solution!) Thank you for being awesome and continually making thrive better…you rule! OMG!! I was just speaking with my partner yesterday about wanting to do a quiz to attract leads. Was going to start searching for a plugin this afternoon when the Announcement / Webinar replay email came in. You guys are the BEST!!! I am so glad I opted to make Thrive Themes my complete web design and marketing platform. Another GREAT plugin!! Phenomenal! And very timely for me. I can see an immediate use for one of my clients! 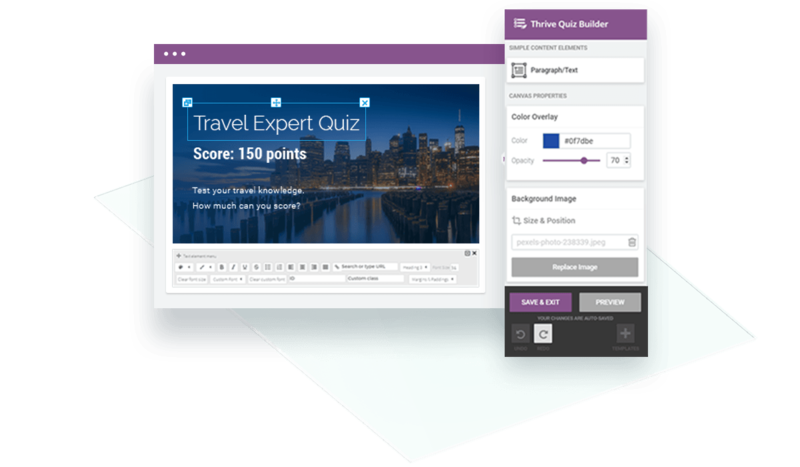 Thrive Quiz Builder will help you easily create beautiful and complex quizzes to engage and grab the attention of your visitors without needing to know how to code or work photoshop. But it goes even deeper. Underneath the surface of building quizzes lies a strategy to help you take advantage of the attention. This built-in strategy will not only help you increase your social shares but also provide you a way to increase the bottom line of your business. READY TO BUILD YOUR FIRST QUIZ?